In the final decade of the nineteenth century, the German biochemist Albrecht Kossel isolated and described Miescher’s “nuclein,” which he renamed nucleic acid. Further analysis revealed the presence of five organic bases: adenine (A), cyosine (C), guanine (G), thymine (T), and uracil (U), which he collectively termed nucleobases—discoveries for which Kossel was awarded the 1910 Nobel Prize. It was subsequently determined that there were actually two nucleic acids, deoxyribonucleic acid (DNA) and ribonucleic acid (RNA). Phoebus Levene was medically trained in his native Russia, but religious persecution impelled him to move to the United States in 1893 to practice medicine and study biochemistry. During a medical leave, while recovering from tuberculosis, he worked with Kossel. After several decades, in the mid-1930s, Levene, at the Rockefeller Institute, correctly determined that the nucleic acids were linked to sugars (deoxyribose and ribose) and a phosphate group—he called this combination a nucleotide—but incorrectly postulated how they were linked together. By the late 1940s, based primarily upon work by Oswald Avery, it was generally understood that DNA was involved in the hereditary process. But its chemical structure continued to be enclosed in a shroud. Austrian biochemist Erwin Chargaff left Nazi Germany during the 1930s and, at Columbia University, analyzed the chemical neurobases of DNA. In 1950, he discovered that different organisms have different amounts of DNA, but that A and T, as well as G and C, were always present in approximately equal quantities to each other. The final chapter in correctly assembling the components of DNA, the double helix, would be disclosed by Franklin, Watson, and Crick in 1953. SEE ALSO: Cell Nucleus (1831), DNA as Carrier of Genetic Information (1944), The Double Helix (1953). 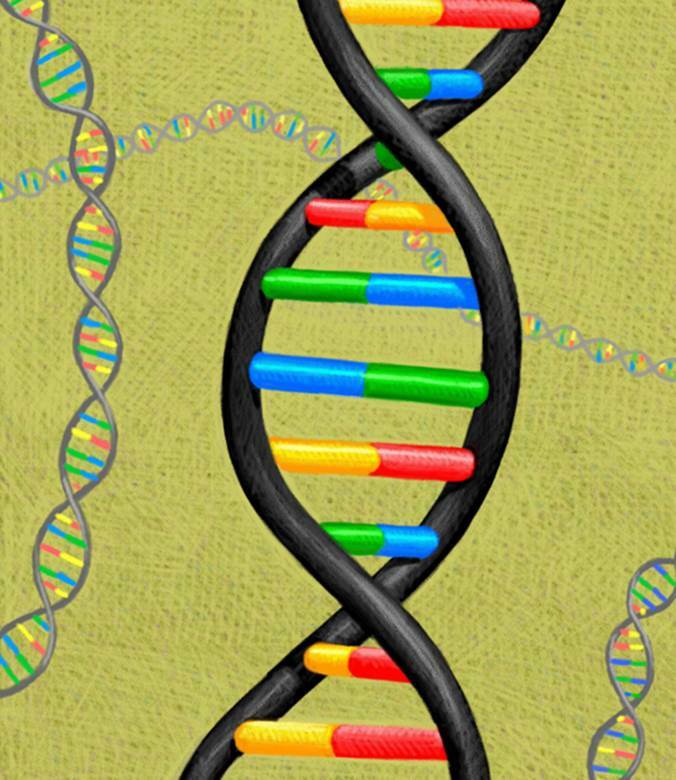 A simplified illustration of DNA, showing two biopolymer chains. Each chain is twisted about the other in a double helix formation, with nitrogen bases linking them.